Villa Wolmar is a lovely holiday home, perfect for families who want to stay in a comfortable modern villa with a large green garden located just metres away from the beach and the Wolmar Lagoon. Next to the villa there is a natural preservation area with lots of wild life to spot and the centre of Flic-en-Flac, where you can find restaurants and shop, is just a short walk away from your doorstep. 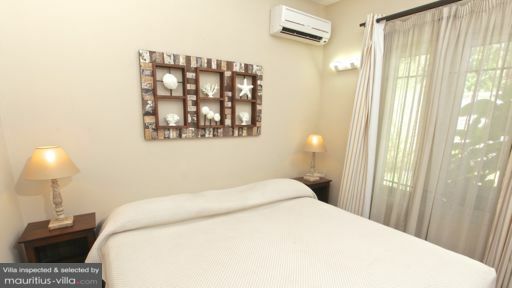 The capital centre Port Louis is a 45 minute drive away. This three bedroom holiday home features a large sunny garden where you can spend days and days swimming in the salt-water pool, kicking a ball on the green grass lawn and enjoying BBQ dinner parties together with your loved ones. Being so close to the ocean also gives great opportunities for afternoon walks on the sandy shore and the sea is also perfect for swimming and snorkeling. The living pavilion is spacious, bright and serene, designed beautifully with red coloured walls that contrast beautifully with the white. On one side there is a dining table for family dinners and on the other side there is a rattan sofa lounge to curl up with something to read. There is a separate air-conditioned TV lounge with plush sofa's facing a flat-screen TV and it is located close to the kitchen so you can easily grab some cold drinks from the fridge. The spacious master suite has glass doors sliding open to the garden and it features a soaking bathtub in the en-suite. The second room is furnished with a comfy double bed and it shares the bathroom with the twin-bedded room, perfect for families. The villa offers housekeeping 6 days a week. This friendly lady will keep the villa spotless and she can also cook and take care of the laundry. A real luxury to have around! A nanny and a car with driver can all be arranged for you upon request. A beautiful villa. Spacious and well decorated, ideal for family holidays. Pleasant garden which we have not yet been able to fully enjoy because of the electrical malfunction (pool and garden lights). The housekeeper, Marie-Michèle is very friendly. She took care of everything. We appreciate her cooking skills and enjoy local dishes. In summary, pleasant stay with a small downside during the last three days: repeated barking of the dog neighbors in the late hours. Present in Mauritius for work, we were advised this rental . 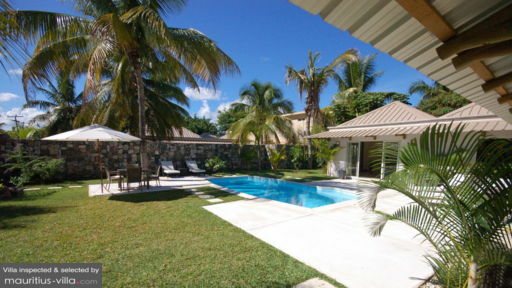 Sublime house close to the beach the service is all inclusive . Well served by Isabelle for the management of the house and spoiled by our housekeeper Natasha . So the work became pleasant . House including a small pool but certainly very valuable . To renew. We stayed in the house for 2 weeks in Oct 2010. There were 4 adults and 2 small children (under 2). The house is located in Wolmar, right next to a small parade of shops (clothes and food) and less than 5 mins walk to the beach. The house is brilliant - huge beds, air con in every room and a lovely outdoors eating and relaxing area that you can shut off in the evening from the insects! The pool is a great size and was very clean (owner had men come and clean it every 2-3 days). There is a massive fridge with a built in water filter/ice machine which we found really handy. The house came with a maid (Stephanie) who we just loved! She didn't speak much English but we managed to communicate our needs. She cooked for us every day - we just gave her some money for the groceries and she cooked us a variety of Mauritian dishes, which were superb. It really made it a holiday not having to worry about preparing meals every night! She also kept the house nice and clean and was great with the little kids. Thank you Stephanie!! 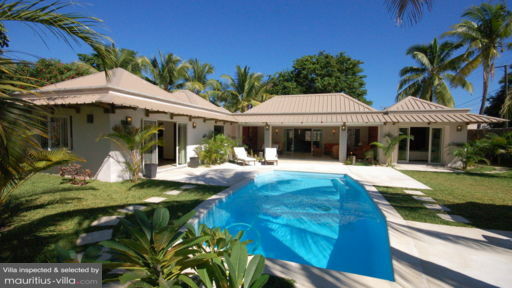 All in all, it is a fantastic place to stay in Mauritius. In terms of value for money, it is excellent. We are sooo glad we didn't stay in one of the big resorts as we had everything that we needed but had our own big space and pool.